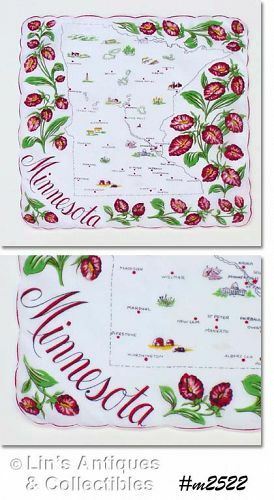 This vintage Minnesota souvenir hanky is so pretty! It measures 13 ¼” x 13 ½” and is in excellent condition. 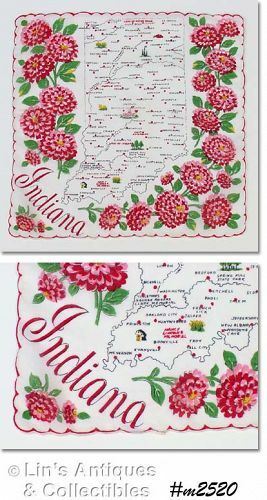 Very colorful souvenir hanky for Indiana! Measures 13 ¼” x 13 ½”, is a Franshaw production, and is in excellent condition. 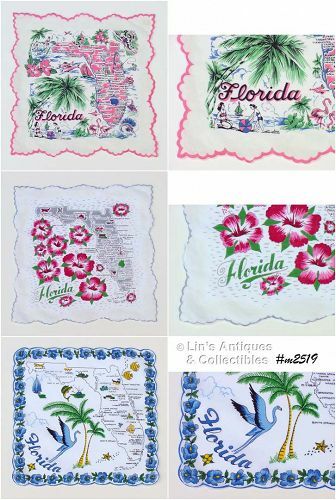 There are 3 Florida handkerchiefs available in this listing! Each has lots of detail and pretty colors. The pink one measures 13” x 13 ¼” and is in excellent condition. The gray one measures 13” x 13 ¼” and is in excellent condition. The blue one measures 13” x 13” and is in excellent condition. 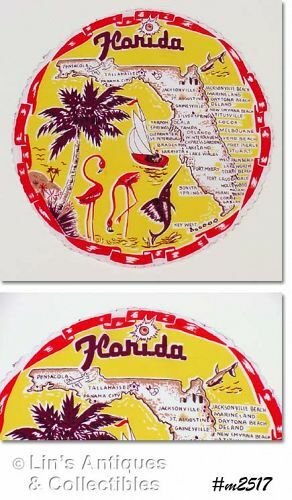 This Florida souvenir hanky is the more difficult to find round shape! It’s very colorful, measures 13” diameter, and is in very good condition – I noticed a small discoloration by the “AU” in St. Augustine. 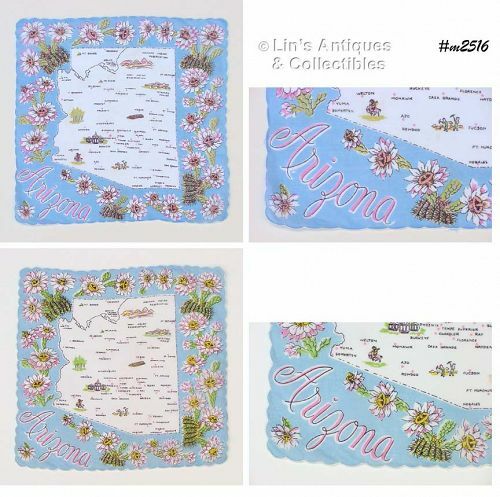 There are two Arizona souvenir hankies available in this listing and both are in excellent condition! The only difference is the coloring of the flowers – pink centers or yellow centers. Hankies measure 13 ½” x 13 ¼” and are Franshaw productions. 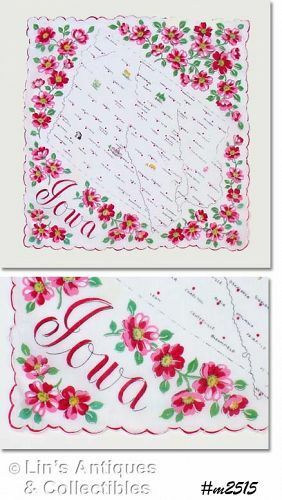 This listing has a colorful souvenir hanky for Iowa! It measures 13” x 13 ¼”, made by Franshaw, and is in excellent condition. 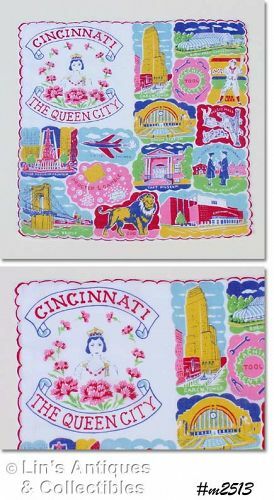 SOUVENIR HANDKERCHIEF, CINCINNATI "THE QUEEN CITY"
This is an unusual Franshaw souvenir handkerchief – it’s for the City of Cincinnati! 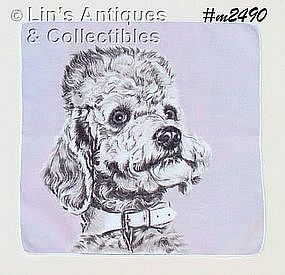 Hanky measures 13” x 13 ½”, is very colorful, and is in excellent condition. Lots of detail on this colorful souvenir hanky for Illinois! Measures 13 ¼” x 13 ½”, is a Franshaw production, and is in excellent condition. 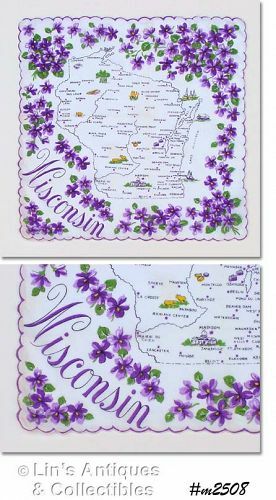 Lots of pretty purple violets on this Wisconsin souvenir hanky! 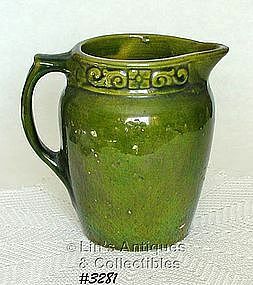 Measures 13 ¼” x 13 ¼”, is a Franshaw production, and is in excellent condition. 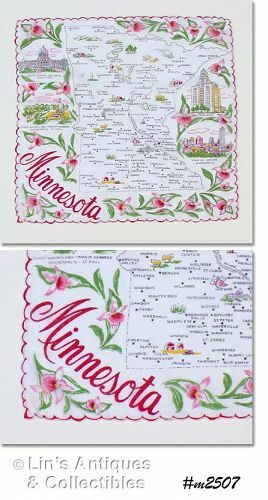 This listing has a very detailed and colorful souvenir hanky for Minnesota! It measures 13 ¼” x 13 ½”, is a Franshaw production, and is in excellent condition. 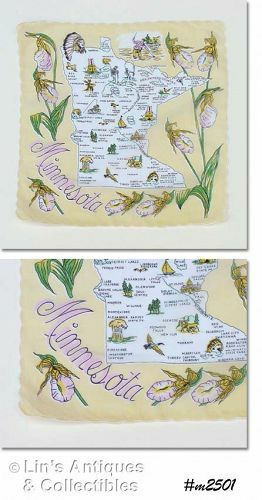 Very detailed Minnesota souvenir hanky! Measures 12” x 12” and is in excellent condition! 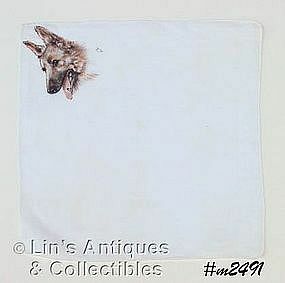 This white hanky has a beautifully detailed dog in one corner! Measures 12 ¼” x 12 ¼” and is in excellent condition. This lovely hanky would be so pretty framed! It measures 12” x 12” and is in excellent condition. 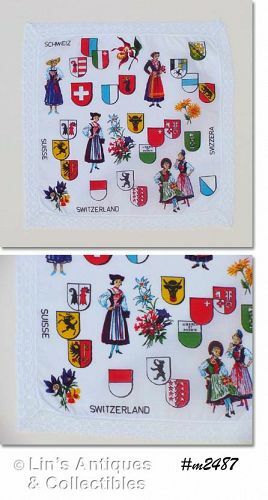 This listing has a neat Switzerland souvenir hanky! It measures 11 1/8” x 11 ¼” and has a pretty lace border. Very colorful and in excellent condition. VINTAGE LOT OF 2 BABY TOYS FOR DISPLAY ONLY!! 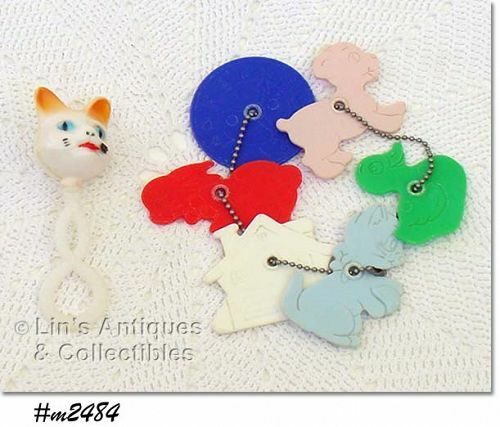 This listing has a cute little cat face/head rattle and 6 hard plastic teething toys on a chain! The rattle handle is soft plastic, cat head is hard plastic and has “beads” inside to make the rattle sound when shaken. The teething toys have different shapes – a round clock face, a puppy, a duck, a kitten, a house, and a bunny. These items are NOT FOR USE – they are display only as they were produced before baby toy safety guidelines were developed. This listing has neat Gurley candles but each has a small problem. The lovely daffodils are each missing a small section of the yellow fluted edge. One church candle and the candlestick candles have overheated during storage and, while they will stand, they are leaning. The steeple on the church candle with bell has been broken and repaired. 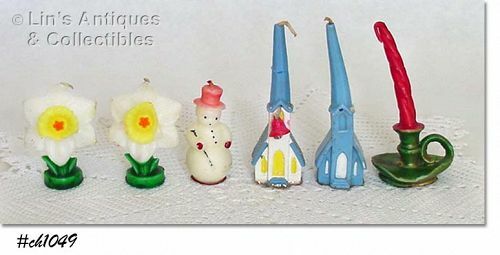 The little snowman candle is a Tavern Company production and he has lost the head of his broom. 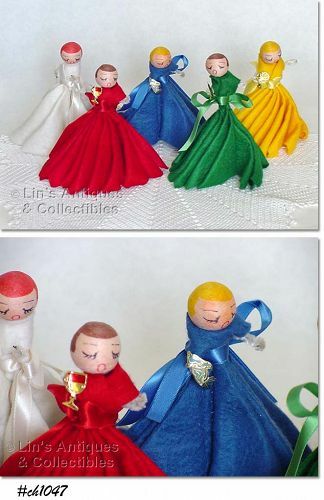 These lovely handmade ladies are so neat and have been a part of my vintage Christmas collection – I purchased them at an antique shop in the early 1980s! The ladies measure 5” tall and their “dresses” are felt with a color-coordinated ribbon at the waist that’s tied in a bow at the back. Their “bodies” and “arms” are pipe stem cleaners and their “heads” are made of spun cotton.